Thank you Highlander! I realized years ago that many have no idea of Libya's history with colonization. I do have a question. In my experience, I've found that the legacy of Italian brutality in Libya is more alive in the Sharg (East) than the Tripoli area. I mean that people are much more resentful than in Tripoli. Do you think this is true? And, if the answer is yes, do you think this is because much more rebellion took place in the sharg? I myself have a foot in both the sharg and el 3'arb as my mother is Trabulsia and my father is from Derna. From what I've seen, it seems that the sharg is more protective and isolated while Tripoli is more inviting of foreigners and their culture. Just a thought. Awaiting your perspective. On my blog, I posted a poem written by a Libyan about the legacy of the Italian occupation of Libya. Check it out. hey welcome back smokey? interesting analyses..actually I never noticed ..but maybe you are correct? I hope that the Lybians don't hate all the Italians for a Dictator's faults. By the way, I disagree with any Italian govt who does business with another Fascist Dictator like Qaddhafi. I hope that freedom will reach Lybia soon. I also think that it's time to reconcile us Italians with the Lybian people. I disagree with reconcile with Qaddhafi. We italians have already payed a compensation for the colonisation of Libya; we don't want to pay a compensation for our imperialist past every time a dictator came in power in Libya and reclaim "a compensation". Then, Libya before the Italian invasion wasn't free, but occupied by another very empire, the Turkish Empire. This empire was very arretrated and Libya was arretrated for this too. The Italian colonization didn't bring only bloodbath and repression, but it bringed also infrastructure, modernization, ecc... I know that the Libyans didn't want a foreign occupation, but it seems me that after the revolt in the 1920s-1930 there weren't others rebellions against the Italian rule, and this was caused by a certain good amministration. The brother of my grandparent went to Libya in that period and when he return he said that the Libyans didn't hate Italians, on the contrary there were quite good relations between Libyans and Italians. Before saying request, Qaddafi must responding of his crime against Italy, like the indiscriminate expulsion of what remained of the Italian community in Libya in 1970s and the launch of missiles against the Italian island of Lampedusa in 1980s. And remember, if the sanctions against Libya are abrogated, it is for the most part merit of Italy and the good relations between Qaddafi-Berlusconi. Hi Stefania and anonymous, sorry to reply so late I never knew that you wrote in here until I checked my archive. I agree with your point Stefania, as for you anonymous, I think the Italians families who lived in Libya will be getting compensations soon . Well take my name as 'Friend'. Well regarding stefania's post i say: The way libyans shouldnt hate the italians for the crime the colonists did and behave as equal with them. Same way the Americans and the whole world should not hate the Muslims and the Arabs for what Osama and Saddam did. All the muslims all over the world are suffering for Osama and Saddam. All mankind should be treated as equal and there should be no discrimination. And well as one of the anonymous post said that his grandfather's brother went to libya at the time and found out that there aint no hatred between Libyans and Italians, that might not be true since he may have not gone to the people who actually suffered he must have gone to the people who lived a fine and rich life given to them by italians in return for the porganda for them to spread that there aint no hatred among the italians and libyans and had different thoughts about the Italian Invasion on the poor armless farmer-type Libyans. Libyans might not have been that advanced, but well who knowns that the European Culture is what the other Libyans(who met the Grandpa's Bro) think is advancements, turkish people where also quite advanced. You know the Algorithms on which all the modern computers depend was discovered by Kurdish(Persian) Mathematician Al-Khwarizmi. Omar Ben el-Mukhtaar was a great Hero. Thats all i gotta say about him. I hope and pray that there be harmony between the italians and the libyans, and in the whole world, and all the humankind shall be treated as equals. 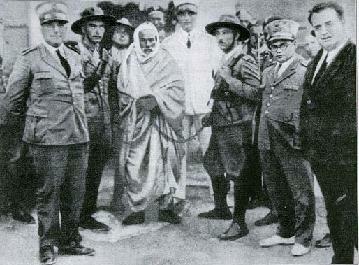 i watched the movie omar mukhtar and he says" no nation has the right to occupy another nation". how would you feel when someone took oer your house, raped your women, looted all you have and shot you for no crime. I'am not Italian nor Libyan, but the movie Omar Mukhtar made me cry for the first time in my life; taught me what is to own and to be owned. I am one of the "Italians" - or Libyans seen from a different prospective - expelled or actually exiled from Libya in 1970. As a person born in Libya and knowing its history, and of all its ethnic components as the back of my hand, I invite you *not to believe* the odious propaganda-wise version of history which is presented by many radical (frequently young) Libyans, although quite well wrapped. The first falsity of these strongly biased radicals is that they present the history of Libya and of the Italian-Libyan relations as if they occured in a short period of time. They try to convince you that becuase of the bad, bad, bad colonialism the poor Libyans still suffer today, and - by the way - they say that this is also the reason why they expelled the Italians from Libya in 1970. The situation and history is quite different and more complex. - Colonialism was surely a most negative policy and practice, yet it was a political phenomenon unfortunately popular in those years: virtually all powers, and not only Europeans, engaged themselves in such expensions. Also the Turks had long been expansionists and dominators. The Italians thought they could take Libya from the Turks when in 1911 they waged war against them (the war is still today defined "Italo-Turkish" war). - Italian colonialism and occupation led to the sufference, deportation and death of a part of the population in Eastern Libya during the military expansion stage, and to all the negative aspects related to a subdued population in all the country. However there were also positive aspects and influxes: the Italians invested fortunes (whether on a private level or government level) in their colony for its infrastructures, housing, hospitals, industrial plants, craftsmen shops of all kinds, plantations as Libya never experienced before. They worked very hard and did their best to make it a prosperous country. On a social level, despite the negative aspects of colonialism, the presence of skilled Italian workers and entrepreneurs, the human qualities of most Italians and also of the Libyans, and consequently the ordinary day-to-day relations between the two communities, led to a general improvement of the country, and of the living standards of the population. This does not justify of course colonialism, but any fair and wise person should understand the entire picture, and especially, it should be placed in its correct historical frame, IE that of a completely different historical and political era of this planet. - after the occupation of the British in 1943, the country underwent 5 years of British Military Admnistration (BMA). The British and the Americans brought new ideas, new enthusiasm, capitals,and opportunities in the country. Both Italians and Libyans were positively influenced by these models, which despite the negative aspects of any foreign administration, were most useful for the country. - in 1951 finally Libya became an independent country, also with the vote of the *new* Italian government at the U.N. The two countries, one new-born (Libya), the other born again and completely re-founded after Fascism (Italy), wisely understood that it was better not harking in the past, but rather they established a new respectful and cooperative relation. The Libyan government signed a treaty with the UN which sanctioned that all minorities present in Libya (Maltese, Jewish, Armenian and Italian) had the right to live indefinitely in Libya. In 1956 Italy and Libya signed a treaty closing all previous colonialist matters and disputes, with a compensation given by Italy to Libya. After this, a peaceful period followed, in which Libya became more prosperous, and in which the Italians in Libya worked hard for the well-being of the new country, of which they were loyal and respectful subjects. I was born and bred in Libya in that period. The colonialist wrongdoings (and also the good things) were very distant in the past, the Italians and the Libyans had all the reasons to cooperate together, and they did. There were generally friendly and cooperative relations between the two groups. In 1970 though, 27 years after WW2 and colonialism had ended, Qadafi and the radicals decided to accuse the poor Italian civilians living in Libya which had become *at that point their native country* with most infamous accusations of colonialism. It expelled them barbarically from *their country* and "repatriated" them to Italy. No understanding on their part that at that point they were *Libyans as well*, or that they had the right to be considered such. No understanding of the sufference that this caused them, especially from a moral and social point of view. 700 billion Lira of their homes and economic activities were confiscated, not one word of sorry henceafter. 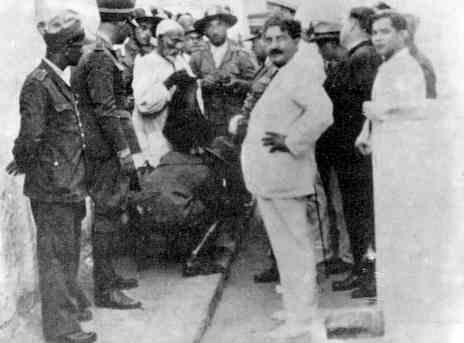 These people were only good workers, good citizens, loyal, respectful and friendly with the other ethnic groups. The regime's propaganda industry starts: they claim that they did it because of the Italian occupation (1911, because of Omar Mukhtar's assassination (may he be blessed), which occured though in 1932, 38 years ealier, in a different world, etc. Ironically, despite the confiscation of goods, more funds are asked as compensation of colonialism. Since Libya is a (very) rich country, it is evident that the reason is not economical. Then what is the reason? Hear this dear Europan liberals and leftists (to which I belong), and hear this you fellow national Libyans whose brain was not embued by the propaganda. - Qadafi's regime expelled not only the Italians, but also the Libyan Jews whose presence in Libya dates back the 2 century BC (before the Roman conquest, let alone before the Arab). Also the Maltese, the Armenians had to go. 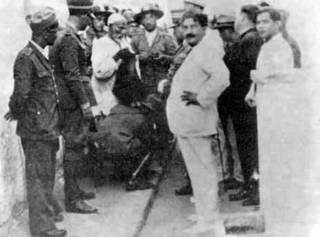 Also at times the Tunisians, the Palestinians and the Egyptians were expelled at times. - Qadafi's regime is highly nationalistic, nearly shovinistic. It implemented the army beyond need and reason, it has expansionists aims with its neighbour (war with Tchad). - it is not a democratic regime, but rather tyrannical. - it also follows a sort of religious nationalism: they are proud to claim to practically have "cleaned" Libya of all other religious groups. The Ministry of Interior proudly boasts that now Libya is a "100% Islamic country". So the story of the "compensation" is just a nationalistic mania and instrument at the same time, for their pride, to humiliate Italy and the Italians, but particularly to generate the support of the population by displaying an inexistent external enemy. It just makes every one happy doing it: nationalims is a form of pleasure, for most. A country asking compensation of atrocities should not commit atrocities in its own turn. The Libyans especially young are brought up to have hatred for Italy, the Italians with the excuse of the past colonialism. The propaganda industry works literally clockwork. Today, I who consider myself Libyan as well (so you see the border between "Italians" and "Libyans" is quite thin) after a period of nostalgia because I was uprooted from my country, I would not want to live there anymore. And perhaps despite all the sufference of the exile, and of not feeling at home anywhere because of it, I consider my self fortunate not to live in such a society with so little compassion, democracy, ideas, enlightenement, skills as contemporary Libya. To my former fellow Libyans may I only invite you to work hard on the way of civility and amelioration, a lot needs to be done.